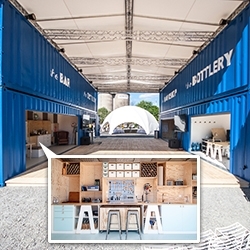 Skog & Stuveback made the ”Absolut Creative Space” in Stockholm out of 4 shipping containers used to ship Absolut Vodka. 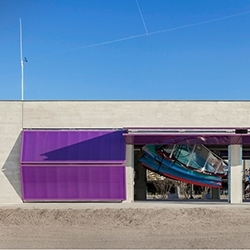 Love the purple fold up garage doors in the new Northwestern University Sailing Center designed by Woodhouse Tinucci Architects. 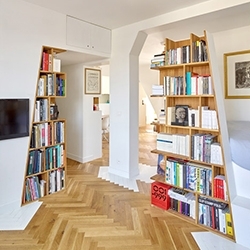 h2o Architectes renovated a lovely apartment in the Arsenal district of Paris with amazing slanted wooden bookshelves fitted into every nook! 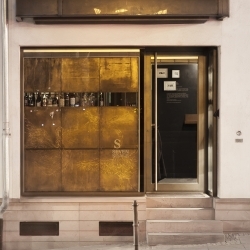 Seven Swans & The Tiny Cup, a very small bar in Frankfurt, Germany, with just 15 seats, designed by Hidden Fortress Design Studio. 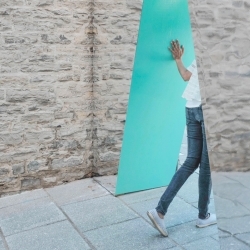 As part of 'Les Passages Insolites', creatives Francis Fontaine, Luca Fortin and Pascal Labelle created the 'Petite Vie', a mirrored site-specific installation that plays with the surrounding reflections of the neighborhood. 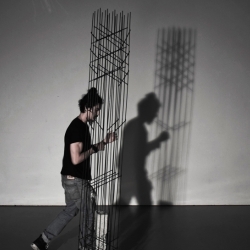 Urban Campsite Amsterdam 2015 - Art. Sleep. Experience. 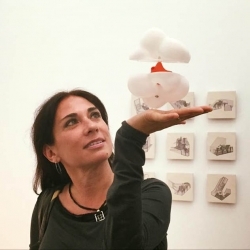 Beyond the events on site, you can even airbnb the various installations! C.R.E.A.M. 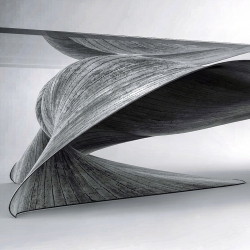 table by Onur Ozkaya developed by using glass and fiber reinforced concrete mixture formed by plywood board frames. 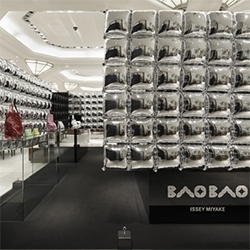 Japanese studio Moment design inflated Bao Bao, a temporary retail store for Issey Miyake inside a historic department store located in Tokyo's Nihonbashi district. Special stairs for the small dogs! Designers at 07BEACH included half-size stairs for the small dogs that lived there, enabling them to more easily walk up the stairs in this Vietnam home. 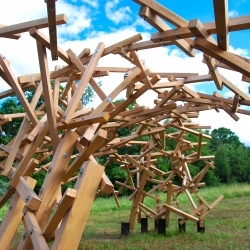 The Species Niches Pavilion commissioned for the Omi Sculpture Garden in Ghent, NY, formed from 1,000 pieces of small oak. 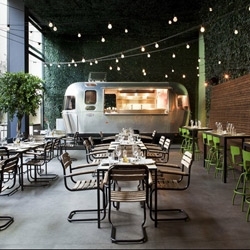 Restaurant 48 Urban Garden in Athens, on the ground floor of the Ileana Tounta Contemporary Art Center. 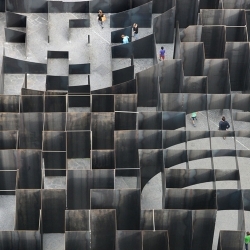 Belgian architects and artists Pieterjan Gijs and Arnout Van Vaerenbergh with an immersive labyrinth to mark the tenth birthday of the C-mine art centre in Genk, Belgium. NAS architecture's SCAPE pavilion for festival of lively architecture - The main pavilion of the 10th édition of the Festival begins from the ground, unfolding in a multitude of random steps around the old majestic columns of the courtyard. 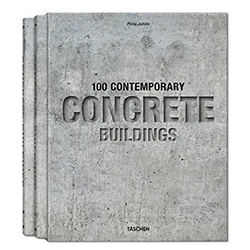 100 Contemporary Concrete Buildings from Taschen. 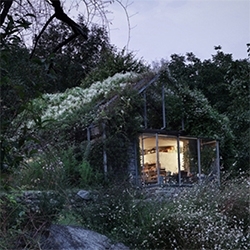 Another concrete building book, but they are so beautifully intriguing to look at. 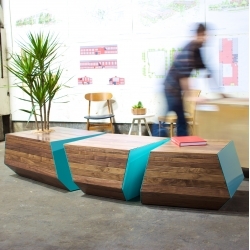 The Boxcar Bench from Revolution Design House. 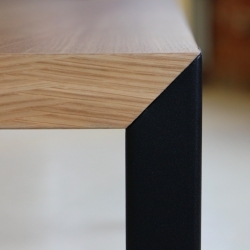 Designed and handmade in Portland, Oregon. The latest in the growing Boxcar series. 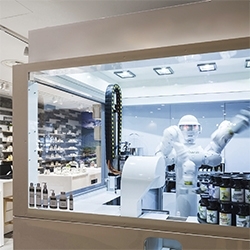 Brigada Alpstories concept includes a robot that makes customized beauty products. 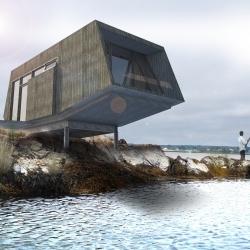 Westport Kayak House single room retreat in Westport Point MA. 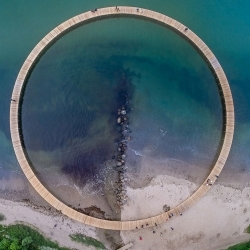 As part of this year’s Sculpture by the Sea festival, Danish practice Gjøde & Povlsgaard have installed ‘The Infinite Bridge’ in the scenic coastal landscape surrounding the city of Aarhus. 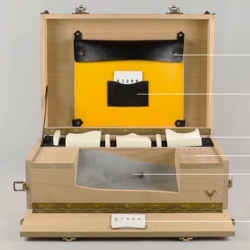 VIDEO‘bad box’ integrates emerging technologies, digital tools, and traditional craftwork allowing creatives to showcase proposals effectively both digitally and physically. 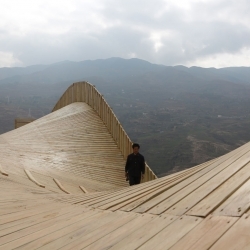 The Warp in Ludian town, Yunnan, China is an undulating viewing platform by architects John Lin and Olivier Ottervaere. Act Romegialli Green Box - can't stop staring at this lovely unused garage turned into a vine covered gardening, cooking, hang out space. 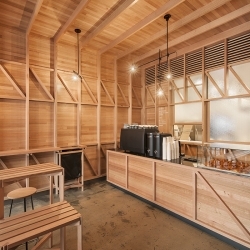 In an exclusive with Studio -Gram’s Graham Charbonneau, salivate over Abbots & Kinney, the latest handcrafted patisserie causing a stir in Adelaide, Australia. 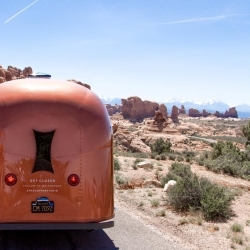 The Copper Studio is a mobile boutique touring the US this summer to "roll out" the Kit + Ace brand. This is the latest venture from Lululemon founder Chip Wilson. 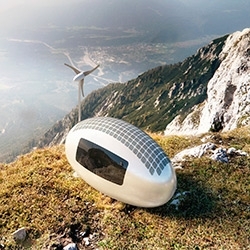 Tired of boring reception furniture ? The Butler is your solution ! 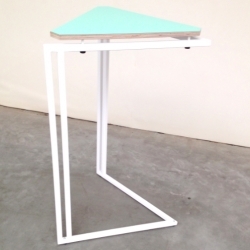 These stackable triangular reception tables designed and produced by young Belgian designers will conquer every party. "Unexpected Hill" - SO? 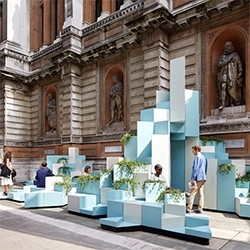 Architecture and Ideas were commissioned by the Royal Academy of Arts and Turkishceramics to create an installation at the Burlington Gardens in London. Made of ceramics. 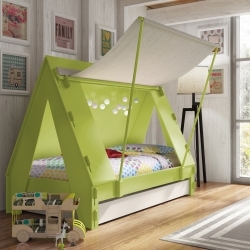 Kids Tent Cabin Bed by Mathy By Bols - sleep under the stars every night! 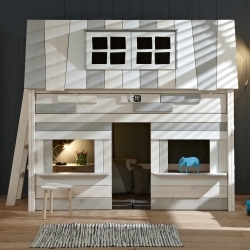 The Hangout Mid Sleeper Kids Bed with Play Area - a real home from home! 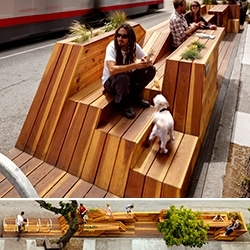 Interstice Architects Sunset Parklet in SF. The parklet consists of 4 “strips” that undulate along the length of the parklet, providing built-in seating, tables, and native planting, a dog watering area with leash ties, and a built-in bicycle rack and pump station. 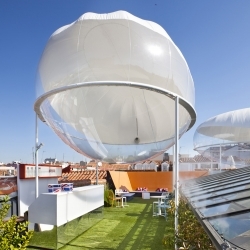 Spanish architect Carolina González Vives filled the rooftop of Casadecor in Madrid with a series of inflatable pods, cools the outdoor environment with minimal power consumption. 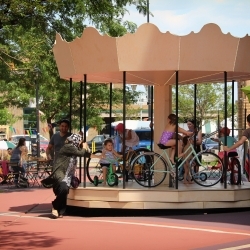 Shamrock Carousel - urban adaptation of the fair carousel where bikes replace traditional horses, characterized by interactive and playful furniture. Yalla Yalla! 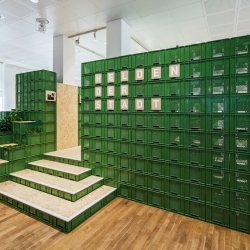 - studio for change creates with 1200 green vegetable crates the design for the exhibition Helden der Stadt. 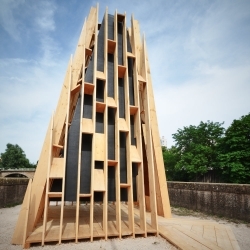 La Hute, a new wooden Building by les etablissements tourneux for the Cabanes festival / Metz / France. A wooden bell and small mechanical music box playing Prokofiev's Peter and the wolf. 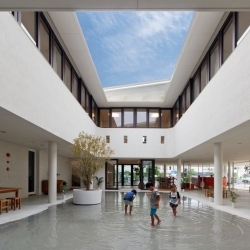 Dai-ichi Yochien in Kumamoto City, a preschool with an open roof and design that forms puddles perfect for splashing in when it rains. 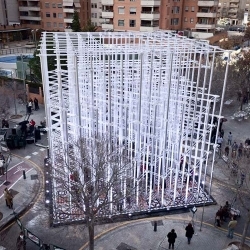 Art collective Pink Intruder has realized a pavilion made with cardboard tubes with a metallic appearance atop a mosaic made of 96,000 wooden pieces in the heart of Valencia. 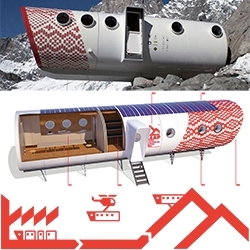 Leap Factory's prefabricated building system, ideal for the construction of new alpine accommodation structures. 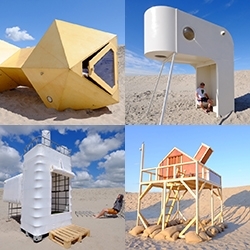 These cylindrical structures are manufactured offsite and helicoptered in to the final site. Rebuild Nepal - 3D printed building blocks allow you to build them yourself. 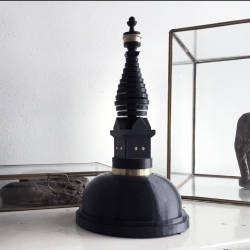 Proceeds go towards helping rebuild Nepal's iconic temples after their horrible Earthquakes. Brunelleschi’s giant Cupola stands out as one of the most recognizable symbols of Renaissance Florence. 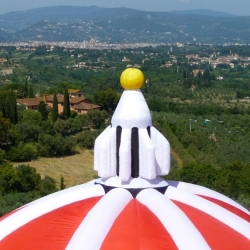 Italian architect Lapo Binazzi has recreated the dome using inflatable nylon materials in striking, bold colours. 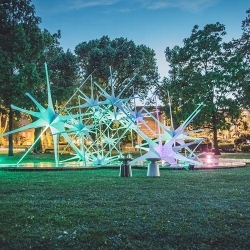 Tokyo-based practice Nonscale designed the Sky Pavilion for a lawn in the Museum Gardens, a park neighbouring the V&A Museum of Childhood in Bethnal Green. 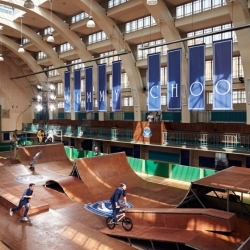 Jimmy Choo crafts action-packed launch of their SS16 Men's collection at “Jimmy Choo Sporting Club” skatepark in London, where the BMX and skateboarders doubled as the models! 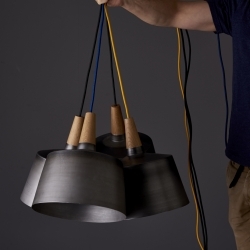 Australian design company Noddy Boffin, have released a new pendant light inspired by the conical form of a ‘morse Taper’ (aka machine taper). 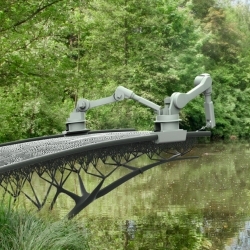 MX3D Bridge - With our robots that can “draw” steel structures in 3D, we will print a bridge over water in the center of Amsterdam. 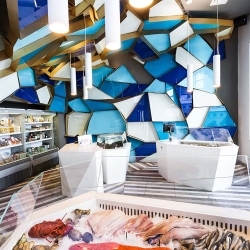 Canadian designer Jean de Lessard has reinvented a walk on the bottom of the sea in this striking fishmonger in Montréal. 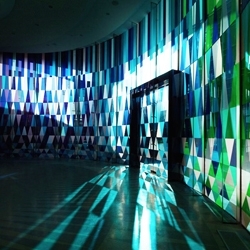 The Rainbow Chapel, designed to be a place for nuptials of young, creative couples, situated inside the G+ PARK in Shanghai, is a part of the Shanghai Museum of Glass.